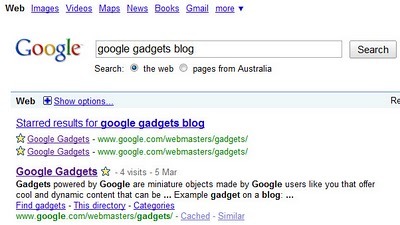 Did you happen to see the new “Google Starred Results” on your last search? It would have showed up at the top of the search results. It’s like an interactive “favorites” button – but one that stays in Google and not necessarily on your computer. My question about Google Starred Results (and I see Wayne Liew has the same question) is whether they’ll play a part in the search engine’s algorithm. Since the entire web is moving from “factual proof” to “social proof”, it only makes sense that Google will weigh these stars as “social proof” that a web page is good. Right now “links” and “traffic” are the ways Google measures “social proof”. (I’m way overusing quotes now, sorry). The more links a page has from other sites and pages on the net, the more likely it is that your page is “valued” by the general community. As Facebook and Twitter take over as the leaders of social proof, will a combination of links from those sites plus the stars give a web page even more value to the search engines than either alone? SEO is fun if you like puzzles. And I imagine being the guys that design the puzzles is pretty fun too. If Google wants to remain the top search engine, it continually must prove it returns the best most relevant results. The question for us SEO lovers is whether Google Starred Results is just another piece of that puzzle for them, or is it just an added feature purely for the enjoyment of searchers? So your task, if you choose to accept it, is to star not only your favorite sites as they come up in the search results – but your own sites. And if you’re a company with employees, I’d ask that you have them do it too. It’s a dog-eat-dog world – so don’t hesitate. Step up and play ball. I was wondering why my site had so many stars! Nice!